The Briard is a loyal companion that enjoys social interaction. This breed is smart and confident, but also has a natural need to please. The Briard seeks out opportunities for adventure. It had a tendency to be standoffish around people that it does not know. The protective instincts of this breed can make it aggressive around other dogs. The Briard does well with children and likes to nip at the heels of both children and adults in a playful manner. The Briard requires a moderate to high amount of physical activity on a daily basis. It also enjoys the opportunity to interact with people regularly. It relishes in the opportunity to herd, but the physical needs can be met with a lengthy walk or a high energy play session outdoors. The Briard is capable of living outdoors in a moderate climate, but is best suited for an indoor environment with access to the outdoors or a yard. The coat of this breed requires brushing a few times each week to keep the hair from becoming matted. The major health concerns for the Briard are gastric torsion and CHD (canine hip Dysplasia). As far as minor health concerns, this breed may experience night blindness. On occasion, PRA (progressive retinal atrophy) and heart problems are found in this breed. It is suggested that the hips, eyes, and cardiac system of the Briard be tested on a regular basis. The average life span of a healthy Briard is ten to twelve years. 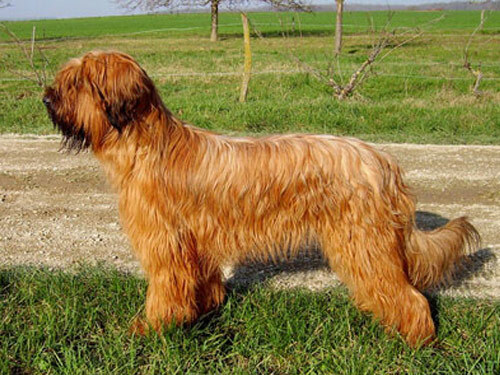 The Briard is put in a similar category as the Beauceron, Picardy, and Pyrenean breeds. The commonality between the four breeds is that they are all considered to be French sheepdogs. The Briard has been around longer than any of the other breeds. Dogs that were similar in appearance to this breed are seen in artwork from as far back as the eighth century. Originally, this breed was called the Chien Berger de Brie, or the Shepherd Dog of Brie, due to the thought that it originated in the area of Brie. There are also ideas that this breed is a version of the Chien d’Aubry, which was a dog that was part of a legend involving the avenging of its masters murder. The Briard name came about around 1809. The Briard used its natural instincts on the farm as a herder, but also acted as a guard dog. Its duties as a herder became especially important after the French Revolution since land size decreased and the need to keep a flock nearby was more important. The Briard became a show dog during the early 1900s. This breed was introduced to America very early and there is data that supports the idea that Thomas Jefferson and Lafayette fancied the Briard and brought it to the New World. During World War I, the Briard was the official dog of the French army and after the war some of the soldiers brought these dogs back with them to America. The popularity in Briard has remained in France, but has been moderate overall in America.